Growing up in the 1950's and 60's children had very little pocket money, if any at all. No young boy owned a football, so we had what was known as the 'the street-ball'. This was purchased by pooling money together. 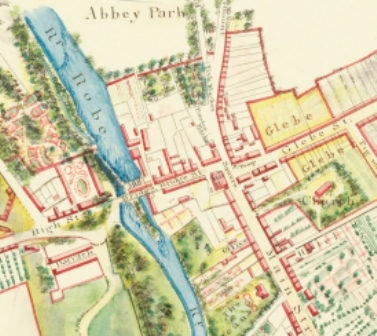 The boys of High Street, Creagh & Chapel Road and Bridge Street earned money by doing odd jobs, such as running errands, weeding gardens etc. The bulk of the money was raised by going house to house collecting stout bottles and returning them to a local pub using a handcart from Watson's garage [a penny per bottle]. Long summer evenings were spent kicking ball on the cinder strewn ground outside Paddy O'Malley's forge, this was our favourite 'pitch' although the wide open space of 'the Green' was nearby. When the forge was closed the doorway was used as the goal for games such as ‘3 goals in’. It always seemed to happen that the smallest boy amongst us ended up crying, storming off yelling "I'm telling my Mam". 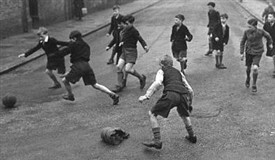 Sometimes local young men would join in for a kick-about; many a shin was grazed after being tackled by one of the 'Cushlough lads' wearing hobnailers (boots). Happy days with the street-ball in Ballinrobe! This page was added by Averil Staunton on 09/12/2013.